William Walond (1719 – 1768) was an organist and composer who appears who have spent all his life based in Oxford. He was not an academic but ranked as a tradesman, employed by Christ Church College as an assistant organist, yet he won the respect of professors of music and organists throughout Britain. Walond was baptised in Oxford on the 16th June, 1719. Very little is known about his life but at some stage he became assistant organist at Christ Church. He was classed as a tradesman like a carpenter or stonemason and one of his duties was to make fair copies of compositions by other composers for the cathedral music library, an activity which rescued many unpublished earlier works from becoming lost. In 1757 he was granted honorary membership of the university through a special process reserved for Oxford tradesmen. The university ran what was in effect a parallel local government independent from that exercised by the town council. While students had to pass examinations to matriculate (qualify) to enter the university, specially selected “privilegiati” (privileged persons) had the rights and privileges of membership conferred on them by matriculation (presumably on account of their already demonstrated skills and achievements). Thus, William Walond became a “privilegiatus” by virtue of his skills as an “organorum pulsator” (literally, a striker of the organ keys) and joined the ranks of barbers, bookbinders, apothecaries, charcoal burners, vets, confectioners, cooks, saddlers and blacksmiths – some of the many trades recognised by the university for admission to the ranks of the “priviligiati”. However, Walond had one additional trump card to play. Having matriculated, he was now entitled to supplicate for a degree, and, as it happened, Oxford still conferred the Bachelor of Music degree (BM) on the basis of a single exercise, without the need for undertaking a course of study and examinations. He was expected to compose a musical work of sufficient standard, and this he presented within ten days of his matriculation. For his exercise, he set the text of Alexander Pope’s “Ode on St Cecilia’s Day” as a choral work consisting of an overture and two acts. Having matriculated on 25th June, 1757, he had the degree of BM conferred 5th July and the following month he advertised for subscribers to have the composition published. The list of subscribers included many musicians across Oxford and the rest of Britain and he went on to publish other works, including the organ voluntary here. 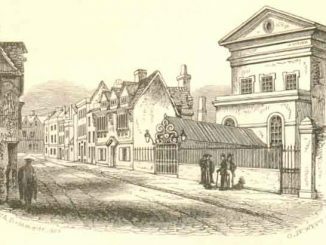 He lived with his large family (14 children) in St Aldate’s Parish, close to Christ Church, but towards the end of his life he became organist of St Peter-in-the-East (now the library of St Edmund Hall) and moved to a stone-built house in Coach and Horses Lane (now the east end of Merton Street) just across High Street and round the corner from the church. He rented the property from Magdalen College for £6.75 a year. As a jobbing musician, Walond also performed at public musical events in nearby towns, such as in in September, 1763, where he conducted at a ball and concert of vocal and instrumental music at the King’s Head Inn, Wantage, in Berkshire. The same year, a benefit concert was held for him at the Music Room in Holywell Street when William Boyce’s serenata “Solomon” was performed. The performers included the singer and organist Thomas Norris, who became organist of Christ Church two years later. 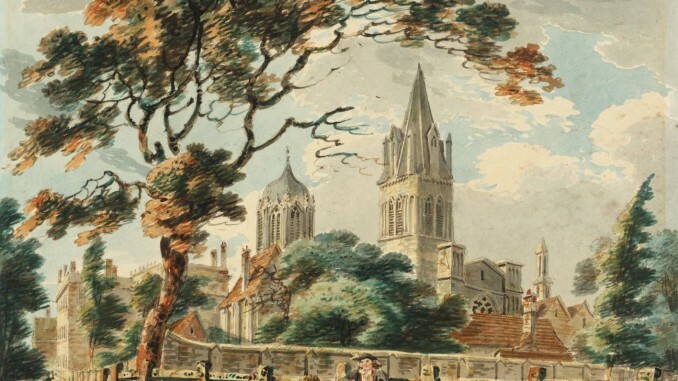 On 21 July, 1768, shortly before Walond’s death in August, the Oxford University Professor of Music, Dr William Hayes, conferred the great honour of conducting a benefit performance of Handel’s “Messiah” to a to a full house at St Peter’s Church, the proceeds going to Walond, the organist. The church recently had bought the organ that had been in the Sheldonian Theatre and it was rebuilt there under Walond’s supervision by Byfield of London, who were also installing the theatre’s new organ. The concert was also the official opening of the transferred organ and featured an organ concerto in addition to the oratorio. William Walond probably died at his home in Coach and Horses Lane in August, 1768. His son, William, became organist of Chichester, but also bankrupted himself. His son, Richard, was a Herefordshire clergyman of note who was also a key organiser of the early Three Choirs Festivals. George was a chorister at Magdalen College Chapel from 1768.